You’ve probably heard that losing weight is 80 percent about what you eat and 20 percent about how much activity you get. It doesn’t matter how many calories you burn at the gym if you follow up your sweat sesh with 5,000 calories of pizza and fries. But even if you’re making an effort to eat healthier, it’s tricky to determine how much of each food group you should be eating, especially if you don’t have a food scale or measuring cups. Luckily, personal trainer Max Weber, ACE, NASM, shared a helpful tip on his Instagram for how to eyeball your portion sizes for each meal – all you need is your hand. 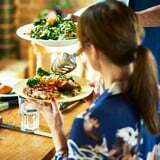 “Controlling your portions – eating the right amount of protein, carbs, veggies and fats at each meal – is imperative for making optimal progress on your fitness goals,” he wrote. For women, a serving of protein is the size of your palm, a serving of carbs is the size of your cupped hand, a serving of veggies is the size of your fist, and a portion of fat should be the size of your thumb. For men, it’s all doubled: a serving of protein is two palm-size portions, a serving of carbs is two cupped-hand-size portions, a serving of veggies is two fists, and a serving of fat is two thumbs. Of course, these are just a guideline; your unique needs may vary depending on your goals, Max explained. So if you’re out to eat or just in a rush to prep your food, use your hand as a guideline and stay on track with your healthy meals!